Recently I had quite the quandry related to one of my current modeling projects. 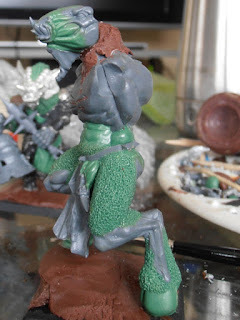 I've been building a flying Doombull model, based on the plastic Daemon Prince model. In terms of size and style, this model was exactly what I was looking for. After some serious alteration and building, it was time to attach his head. That's where the problem came in. I didn't have a head, and I had been completely unable to find one that was even remotely close to what I was looking for. I dug through my massive bitz collection, considering everything that was even close to what I was looking for. 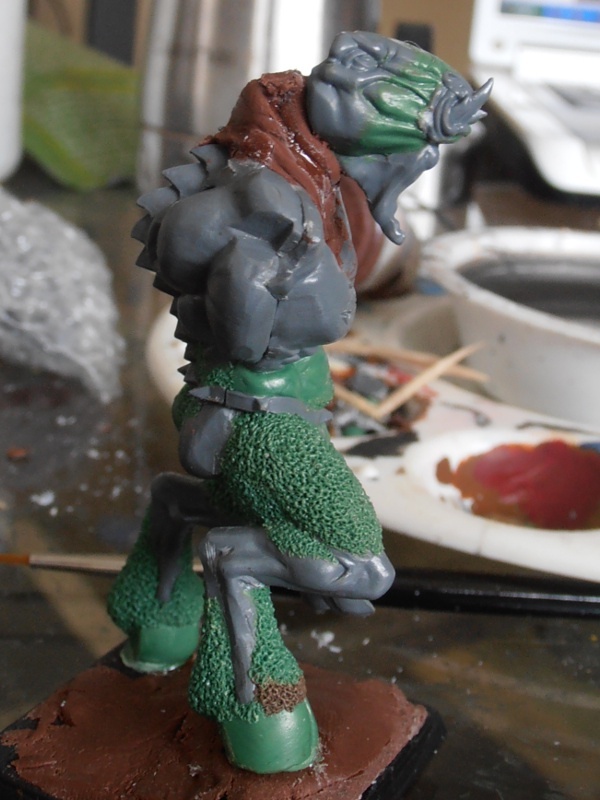 The metal Minotaur and Tuskgor heads just didn't have the style, look, and feel that I was going for. 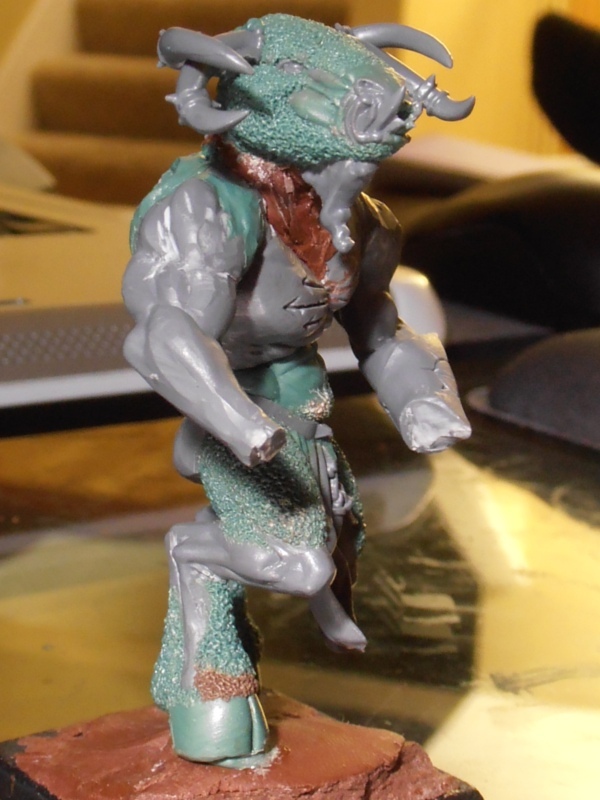 They're great on the metal Minotaur bodies, but didn't flow well at all with what I had going on with the Doombull. At one point I throught that perhaps the Ghorgon/Cygor head would work; as soon as I opened the box I realized that their heads were massively too big. 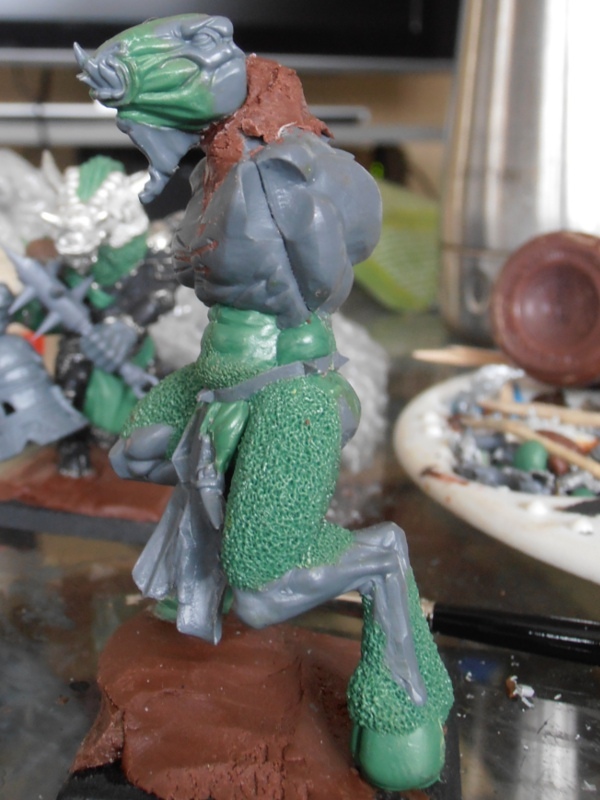 The plastic GW Minotaur heads were too small for the body, and looked rather silly when put on the model. From there, I dug through my old complete Citadel model catalog book. Nothing came from that. 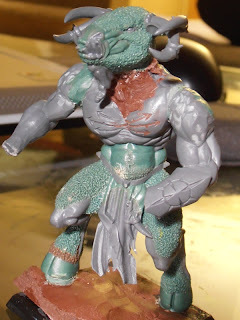 After that, I browsed the web for Minotaur models. A few great resources were the Bane Lords web site, and chaosorc.com; the latter of which had many different types of Minotaurs. Despite my best efforts I could find nothing that fit what I was looking for in terms of theme, style, and size. After that failed, it seemed that my only option was to create my own solution. 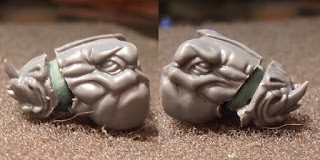 Since the GW plastic Minotaur heads were the closest thing that I had to what I wanted, I started with one of them. The head needed to be both longer, and wider. 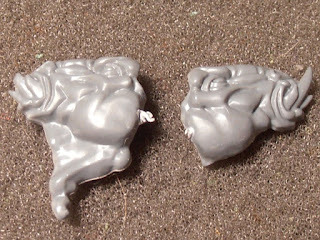 Fortunately, it comes off the sprue in two pieces width-wise. I cut it with clippers length-wise. 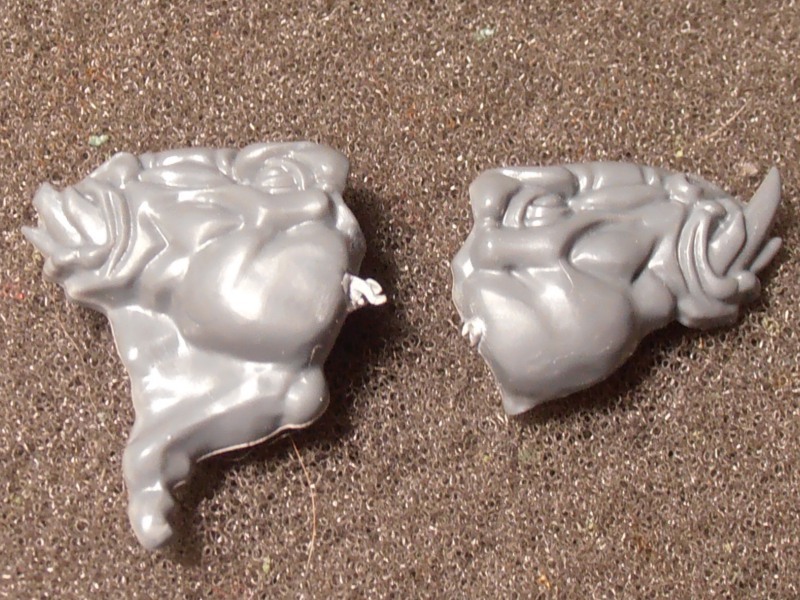 After that, the head was in 4 pieces. The next step was to see if I could rebuild it, both longer and wider. 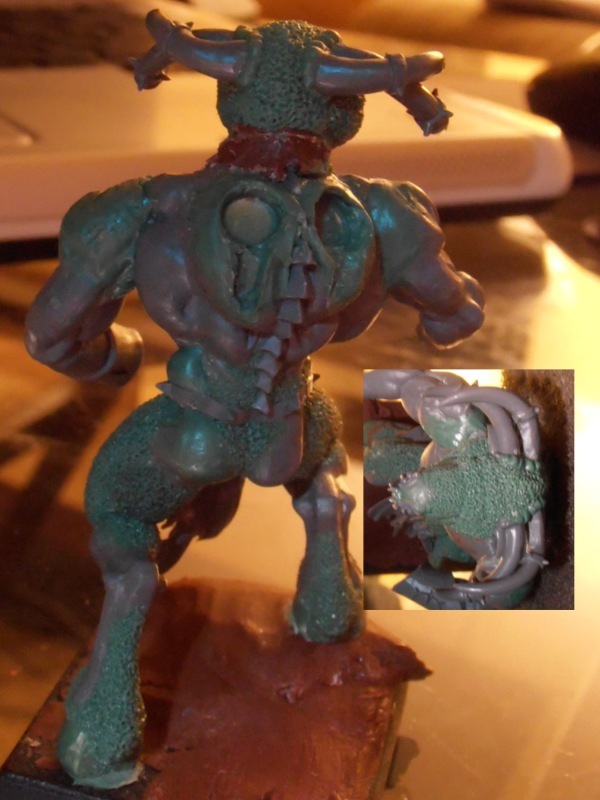 I used a ball of GreenStuff, and some super glue to accomplish this. 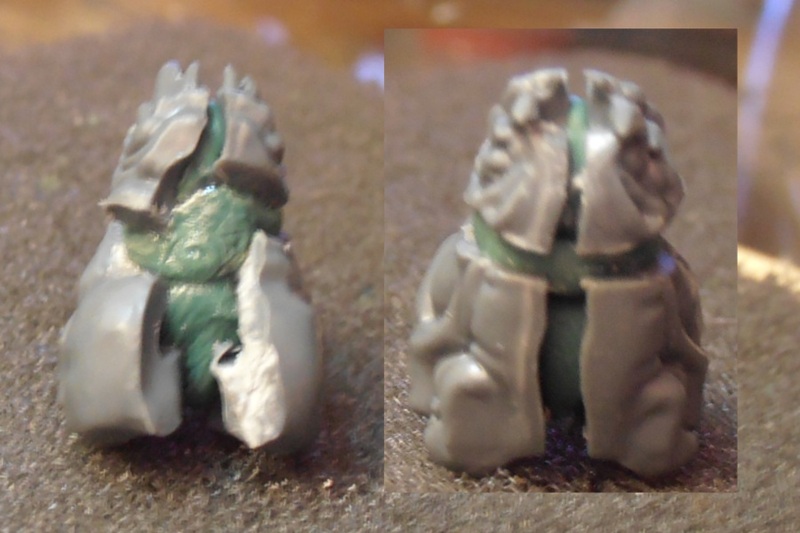 I stuck each piece into the ball of GreenStuff, in its appropriate place. I manipulated the pieces until the width and length looked like what I wanted, and everything was properly straight and lined up. I then put a bit of super glue into the lenthwise crack, on both the top and the bottom. After that, it was a breeze. I GreenStuffed the cracks, smoothed everything over, and then added the appropriate details to make it look like it hadn't been changed. 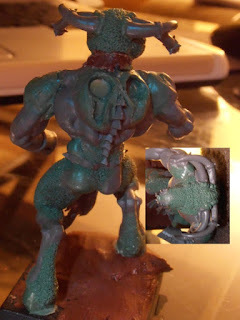 Once the GreenStuff was dry, I attached the head to the body. I bulked up his cheeks to make it look more like the old metal Minotaur models, and to give him some more size. I also added a bunch of fur for those same reasons. To help distinguish him from the other Minotaur characters, I have him a second set of horns as well. That's it for now. Stay tuned to see more of this fella. Looking good, great job on the head! Great work Johnny. It looks AWESOME!!! I'm looking forward to seeing you again next year at North Star. Looks great, btw I wanted to let you know that I nominated your site for a Liebster award since I enjoy your posts. I have no idea what a Liebster award is, I'm gonna have to look that up. Hey Kris, I tried your idea with the blood letter musician horns as minotaur horns. One of them would have ended up backwards, unless I wanted to seriously modify it. I ended up going for this double horn look instead, but I still think you have a solid idea there.